Wedding Cake Rock is one of those phenomena that make you ask “Is it really natural?”. The perfect straight lines, right angle and bleached white rock can seem man-made. But it is 100% natural, and spectacular. So where is Wedding Cake Rock and how do you get there? We’ll also solve the mystery of why it’s so white. Wedding Cake Rock is just north of Marley Beach in Royal National Park, Sydney. For this reason it’s also known as the White Cliffs of Marley. You can’t drive directly to Wedding Cake Rock. The nearest access is via a 3km walk along the Coast Track from Bundeena. (It is Stop 3 on the Royal National Park Coastal Walk Map). The one hour walk is a little challenging in parts but the views along the way are extraordinary. Things may have changed since you last saw #weddingcakerock photos. National Parks and Wildlife Service (NPWS) have fenced off the actual rock so you can’t walk on top of it. Forget about sitting on it too, or being perched precariously near the edge. But you can still see it and it’s well worth the visit. NPWS have restricted access to Wedding Cake Rock for safety reasons because it’s severely undercut and at risk of falling. They’ve put up a steel fence to stop people walking on the actual rock. Don’t risk your life for Instafame. You can still get a great photo by walking a little bit further south up the hill. This gives a great perspective looking down over the top of it. I’ve walked past the White Cliffs of Marley my whole life and several hundred times since founding Sydney Coast Walks in 2009. The gap that separates the slice of cake from the mainland is widening and the surface has changed dramatically even in that time. I have seen this erosion with my own eyes. What I couldn’t see was the erosion from underneath. The fence is ugly, but it’s there for a reason. Use your head and stay on this side. Look, a photo taken from the safe side of the fence! The only thing missing is some daft person doing a cartwheel on the cliff edge, but they’ll live without it. How do you get to Wedding Cake Rock? The nearest carpark is at the start of the Royal National Park Coastal walk. Enter “71 Beachcomber Ave, Bundeena” in Google Maps. There are only a handful of parking spaces so you may need to park in Eric St, or further along Beachcomber Ave. Street parking is free. If you’re relying on public transport, it’s easy to catch the ferry from Cronulla to Bundeena. It’s a beautifully scenic 25 minute trip across the Hacking River, just add another 30 minutes walk through the village of Bundeena to get to Beachcomber Ave.
Download the Wedding Cake Rock Map here. Includes full length of the Coast Walk for other adventures. 6.8 kilometre walk, 2 hour return (there and back). There is a locked gate at the end of Beachcomber Ave, Bundeena. This is the start of the Coast Track. Follow the sealed road (fire trail) until the second turn on your left – about 100 metres – marked ‘Royal Coast Track’. This sandy track will take you to the coast. When it opens out a bit, take a look to your left (north) for great city views on a clear day. When you reach the coast, there is another sign marked ‘The Balconies’. If you look south from here – to your right as you face the sign – the nearest headland you can see is Marley. You might also be able to see a sandy track winding up the hill through the bushes in the distance. Wedding Cake Rock is at the top of that hill. So, turn south, keep the ocean on your left and follow the track to Wedding Cake Rock. When you go down a steep section of new sandstone stairs, cross a small creek and start climbing a hill, you’re nearly there. This is the hill you saw from The Balconies. Most of this track is now boardwalk, with some sections over rock. You’ll see the not-very-nice fence ahead of you, and that’s when you know you’re at Wedding Cake Rock (before the fence, I used to see people walk right past, not realising it was there). Remember what I said about grabbing the best photo? Just walk a little past it to get a great shot looking back north. You could stop here to enjoy the view before heading back along the same path, or…. Another leisurely 20 minutes (about 1km), will get you to Marley headland, with sweeping views of Big and Little Marley Beaches below. It’s one of the best whale watching spots in Sydney too, so I’d consider planning this as your turn-around point. I bet it’ll put the full length of the Royal National Park Coastal Walk on your wish list as you see the trail stretching out before you. It’s not all about Wedding Cake Rock. Above is the view south when you first reach the coast, near ‘The Balconies’. And below is the view from Marley headland. What is Wedding Cake Rock? Sydney’s foundations are sandstone. It’s everywhere. Under our feet, along the coast and in all the old buildings. It’s full of distinctive rusty-coloured tones and patterns. This is typical Hawkesbury Sandstone you find throughout Sydney and Royal National Park. Look at those beautiful orange colours – that’s rust! And this is Wedding Cake Rock. Beautiful in it’s white-ness. There is a small gap separating the white cliff rock from the mainland, and a perfect 90° corner that looks like it was carved by a giant knife. It is actually a result of how the sandstone was formed 250 million years ago and the erosion it has weathered since. Some say it looks like a giant slice of cake (pass the fork!). It also looks like a block of tofu or cheese and some call it Tofu Rock or The Cheese Block. I guess it depends whether you have quit sugar, are vegetarian or lactose intolerant. * Remember you need to walk through the bush, so don’t wear thongs or sandals. * There are often muddy sections (not as bad now it’s boardwalk). Leave your pristine white sneakers at home too. * There are no shops in the national park. Take plenty of water and whatever food you need. * No rubbish bins either. Carry out what you carry in. * Toilets are either near the ferry on Loftus St, Bundeena, or at the start of the walking track at the end of Beachcomber Ave, Bundeena. There are no toilets on the track to Wedding Cake Rock. * There is no mobile phone reception along that section of the track so don’t rely on calling your mates to meet up. * Remember to wear a hat and sunscreen, even in winter – the track’s pretty exposed. Enjoy your trip to Wedding Cake Rock and the White Cliffs of Marley in Royal National Park. It’s a unique coastal formation that won’t last forever, so see it while you can. It’s sandstone, sure, but not as you know it. Whether you’re after a Sydney micro-adventure or a bush walk with a purpose, I hope you find these directions on how to get to Wedding Cake Rock useful. 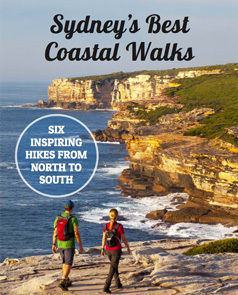 Now go and have fun on one of Sydney’s most dramatic coastal walks. Tagged Royal Coast Track, Royal National Park, Track notes. I heard that the wedding cake rock was closed from May, is it true? Could we visit there at this time? Wedding Cake Rock has a permanent fence around it to prevent access onto the rock itself. You can still see it and photograph it. It’s still a one of a kind rock formation and worth visiting. Cheers, Ian. Thanks for valuable information. Just one more question. How long does it take if walking from Bundeena ferry? About an hour? Just over an hour, Danny. A leisurely 1:15 – 1:30. At least 1:30, Trent. You could do it a bit quicker if you keep your head down and don’t look around… but if you only have one chance to visit you want to enjoy it. It’s all boardwalk now so it’s pretty easy walking.